While I haven’t managed to find much in the way of alternative recordings for these piano arrangements, even their rarity begs the question as to whether such versions are likely to be of much more than academic interest. Schoenberg’s arrangements of large-scale works by Mahler for limited forces have had some attention in recent years, but can two-piano versions of Schoenberg’s scores stand alone against their detailed orchestral originals? While in no way competing against orchestral recordings, there is fortunately much more here than mere pale shadows. Well researched booklet notes by Marco Gaggini outline the reasons for these piano arrangements being made as well as their performance history and a background to the works themselves. The ultimate test is if these orchestral pieces can stand on their own feet as music for pianos. With Berg’s version of the Chamber Symphony No. 1, made with public performance in mind, the results make for quite a flamboyant and expressive score. Schoenberg’s late-late romantic gestures are laid bare, but by no means to their detriment. I wouldn’t want to suggest this has a particularly revelatory effect and if you find this work hard going then this probably won’t supply the cure, but there is plenty here to show the strength of the musical ideas even when the orchestral timbres have to be imagined or forgotten. Timbre is of course an essential element in the Five Pieces for Orchestra, and you can dive straight for the central movement, Farben, to hear where Webern’s imagination creates something new from the seemingly impossible challenge of changing orchestral sonorities on repeating chords with pianos alone. The results are deeply atmospheric and still strikingly modern, as well as owing a few cents in royalty fees to the impressionism of Debussy. The booklet describes an earlier version made with students of Busoni for two pianos eight hands, that seemingly created chaos in rehearsal. Webern’s discipline shines through in this two piano four hands arrangement, delivering plenty of the often highly complex expressionist weight of the original while once again creating something new and intriguing for piano. The Chamber Symphony No. 2 sounds oddly anachronistic when compared to the two previous works, with its apparently more backward-looking and relatively conservative language. Even with technical compromises required by the density of some of this work, this for me is one of the main discoveries of this programme. A piece that emerges stripped of a significant layer of Straussian orchestral patina. 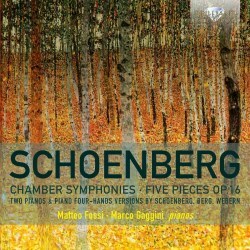 The results deliver something in which the core tensions between tonality, chromaticism and Schoenberg’s senses both of expressive power and a joyful exploration of musical possibilities, are given a striking clarity. This turns out to be a very successful release despite advance trepidations. The recording is on the resonant side, which I don’t mind. The spread between the pianos and the detail in their colours might have been captured a little better, but the effect of the fairly warm and slightly distant balance creates a pleasant and non-fatiguing impression, and this has its own benefits in tricky music of this nature. This recordings does however demand decent reproduction equipment to give of its best. For Schoenberg fans and those who seek some new adventures in piano duo repertoire, this is an excellent place for exploration.